If you have been following up on news about blockchains and cryptocurrencies, you are familiar with terms such as Bitcoin and Ethereum. You have also learned about limitations of the same and scandals that have affected some. Trybe, the expert on the blockchain technology has a few ideas on why you ought to consider investing in EOS. 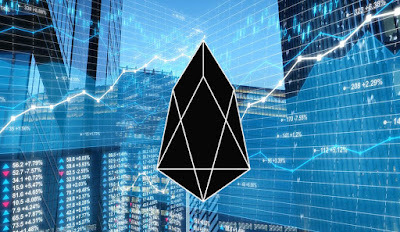 "Why EOS is a Unique investment opportunity"
The fact that EOS has been developed by Block.one, which is synonymous with seeking funds for autonomous and open-source software should be a good enough reason to invest. Block.one is headed by Brendan Blumer and David Larimer. Blumer is an inventive entrepreneur with a successful career. Larimer, better known for his technical skills, is a genius entrepreneur who designed Steemit and Bitshares. Brock Pierce is co-founder and one of the team members of Block.one. He is also the chairman of the Bitcoin BTC Foundation and co-founder of Blockchain Capital. With such brilliant minds at the helm, EOS is bound to be successful and you would want to be part of the success. Many blockchains have failed to impress the investors. As a result, mass adoption has not been possible. As mentioned earlier, EOS is created with performance in mind. EOS offers the minimum requirements of decentralization. Thus, applications require some bit of decentralization, but performance must not be adversely affected. EOS will have the ability to achieve high throughput by leveraging DPoS (Delegated Proof-of-Stake) with 21 specialized block producers. Parallel side chains are essential for this to work. DPOS (Delegate Proof of Stake): a system where stakes can vote for block producers. Accounts: users are able to choose names when they create accounts. Roles and permissions: it enables out of the box anything related to data sharing. Sandboxing: accounts code can be replaced by elected block producers without affecting the entire blockchain. A blockchain cannot be successful without some ongoing funding. It needs funds which are reserved for the development of the ecosystem. EOS uses inflation to pay for network resources and has a maximum of 5% annual inflation. Funding popular projects for the benefit of the ecosystem. EOS offers the fairest ICO thanks to Block.one’s decision to ensure that anyone can participate. Owning EOS ERC20 tokens is the same as owning a part of the project. In other words, Block.one will not be the owner or head of EOS. Block.one delivers the open-source software and anyone can run any version on any network. Consequently, token holders will own part of the EOS project as well as the pioneering Dapps that will be deployed on the main network. Simply put, EOS token holders are likely to get free tokens in the future. This could give an investor a great opportunity to earn some passive income. This income may then be used to price the secondary EOS token rental market. EOS is well on the way to becoming the number one operating system for decentralized applications. If token holders include such successful entities such as Uber, Facebook, Twitter and many more in this league, then EOS is a force to be reckoned with.